W.T. Ellis once said, "it is Christmas in the heart that puts Christmas in the air." As the leaves and mercury fall, let us gather round in celebration of our savior, kindling the joy of life and love in one another's heart, with the sweet smell of Christmas wafting into the night! 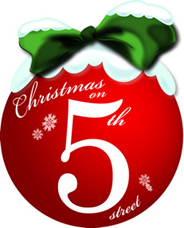 To read about previous Christmas on 5th events, click here for the story, photos, and video. Freshman Class Council invites your organization to participate in the 8th annual Christmas Tree Farm at Christmas on 5th Street. Your organization will decorate a Christmas tree to display your holiday spirit and compete for a chance to win money for the philanthropy of your choice! Registration is due by Tuesday, November 27th at 5pm. If you have any questions about participating in this event please contact FCC@baylor.edu. IFC welcomes you to bring clothing items to donate to the SUB Den from Monday, the 26th, through Thursday, the 29th, from 11:00 AM, to 2:00 PM, in the SUB Den, and during Christmas on 5th Street! Join us on the third floor of the SUB for a Christmas Marketplace, brought to you by Multicultural Greek Council. Featuring vendors from all over the state, check out all the treats, crafts, and gifts!